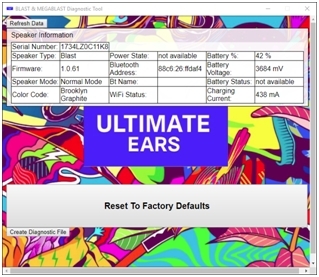 ULTIMATE EARS MEGABLAST 에서 펌웨어를 어떻게 업데이트합니까? Can I pair BOOM, MEGABOOM, or WONDERBOOM with BLAST/MEGABLAST? No, you can only pair other BLAST or MEGABLAST speakers together. No, BLAST and MEGABLAST utilize WiFi to pair, which reduces latency and increases the range of paired groups of speakers. Because BOOM, MEGABOOM and WONDERBOOM do not offer WiFi, PartyUp will not work those speakers and BLAST/MEGABLAST speakers. Can I pair BLAST/MEGABLAST speakers with Echo speakers? No, BLAST and MEGABLAST speakers cannot be paired with Echo devices. Does BLAST/MEGABLAST support Alexa Play Everywhere? No, BLAST and MEGABLAST will not work with Alexa’s Play Everywhere feature. Why can’t you pair this with BOOM, MEGABOOM or WONDERBOOM? BLAST and MEGABLAST utilize WiFi to pair, which reduces latency and increases the range of paired groups of speakers. Because BOOM, MEGABOOM and WONDERBOOM do not have WiFi, they cannot be paired with the BLAST and MEGABLAST WiFi groups. Wie lässt sich die Pairing-Funktion in der BLAST/MEGABLAST App aktivieren? Direkt nach dem Update auf die neueste Firmware wird das Pairing-Symbol auf dem Bildschirm der App angezeigt. Durch Klicken auf das Symbol wird der primäre Lautsprecher in der Mitte des Bildschirms angezeigt. Durch Ziehen und Loslassen können weitere Lautsprecher hinzugefügt werden, bis zu einer maximalen Anzahl von 8. „Double“ enthält die Option „Lautstärke-Synchronisierung“ zum Synchronisieren aller Lautsprecher mit der Lautstärke-Einstellung des primären Lautsprechers. Mit „Stereo“ lässt sich ein Lautsprecher als linker Lautsprecher und ein Lautsprecher als rechter Lautsprecher festlegen für Stereo-Klangausgabe. Can I use Alexa on multiple speakers with pairing? You can still control all speakers with Alexa when they are paired, but you cannot play different music on different speakers as Alexa multi-room music is not supported. Can you get stereo pairing? Yes, with two BLAST and/or MEGABLAST you’ll get a stereo, left and right speaker experience. Is this a multi-room experience? No, this is different from a multi-room experience. The same music plays on different speakers, versus being able to play different songs on different speakers. This is a pairing experience where multiple speakers can be connected together for louder audio. Do I need to pair my speakers every time I want to use them together? If you power the speakers OFF, the paring feature turns off. When you turn the speakers back ON, you will need to pair them again from the app before you can use them as a group. If you turn on and off the speaker for example, and want to come back to playing audio on several speakers, you’ll need to pair the speakers again. How many speakers can I pair? You can pair up to eight BLAST or MEGABLAST speakers. Any combination of BLAST and MEGABLAST speakers are supported for pairs. Wie paire ich meine Lautsprecher? Über die App: Öffne die App und tippe auf die Schaltfläche mit zwei Lautsprechern unten am Bildschirm. Zuerst wird eine kurze Erklärung angezeigt, und dann der „Gruppieren“-Bildschirm. Ein Lautsprecher ist bereits in der Mitte des Bildschirms sichtbar. Nach einem kurzen Moment werden alle anderen Lautsprecher (die auf EIN geschaltet sind) unten am Bildschirm angezeigt. Durch einfaches Ziehen eines der Lautsprecher unten am Bildschirm in die Mitte des Bildschirms beginnt das Pairing. Es gibt eine kurze Verzögerung, während die Lautsprecher synchronisiert werden. Weiterer Lautsprecher lassen sich zur Gruppe hinzufügen durch einfaches Ziehen eines anderen Lautsprechers von unten am Bildschirm in die Mitte, und nach einer kurzen Verzögerung ist dieser ebenfalls in der Gruppe. Vom Lautsprecher aus: Schalte zuerst alle Lautsprecher, die gepairt werden sollen, auf EIN. Drücke auf einem der Lautsprecher kurz die „+“-Taste vorne am Lautsprecher und gleichzeitig die Bluetooth-Taste bzw. Aktionstaste (die kleine Taste oben). Drücke dann am zweiten Lautsprecher zweimal die Bluetooth-Taste bzw. Aktionstaste. Nach einer kurzen Verzögerung sind die beiden Lautsprecher gepairt. Zum Hinzufügen weiterer Lautsprecher (bis zu 8) musst du nur den zweiten Schritt wiederholen und zweimal die Bluetooth-Taste bzw. Aktionstaste drücken, um sie zur Gruppe hinzuzufügen. 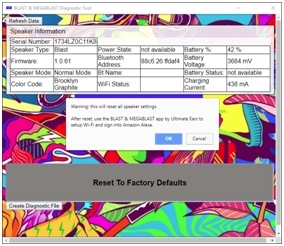 The BLAST MEGABLAST Diagnostic Tool is an application for your PC or Mac that lets you recover an unresponsive speaker and reset it to the factory default settings. The tool also has the ability to gather diagnostic information that can be emailed to Customer Care to help them troubleshoot problems. The tool is available for Windows (10, 8, and 7), as well as MacOS (10.10+). Download the tool and then open it. Mac users should drag the file into the Application folder. Follow the onscreen instructions to install. Connect your speaker to the computer using the USB cable that came with the speaker. NOTE: It’s important that you use the included cable as it supports data transfers. If you need a replacement cable please contact Customer Care. If possible, turn your speaker on. If your speaker won’t turn on, the tool will still work, however. Open the tool using the icon on your desktop, or from the Application folder on your Mac. If the speaker is not detected by the utility, check the USB connection between the speaker and your computer, and then click Refresh Data in the upper left corner of the tool. If the tool still doesn’t detect your speaker, please contact Ultimate Ears Support. Once your speaker has been detected, information for it will be displayed. To reset the speaker to factory defaults click Reset to Factory Defaults. NOTE: Resetting to factory defaults will clear all customer configured information on the speaker. This includes any previously paired devices and Wi-Fi settings. After resetting the speaker you’ll need to go through the app setup again before you can connect to Wi-Fi or use Alexa. 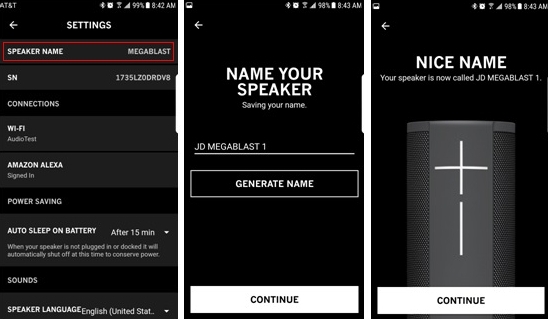 Once the reset completes, turn your speaker on and use the BLAST & MEGABLAST app to set it up. If your speaker continues to be unresponsive after the reset or has other issues in general, please use the following steps to create a Diagnostic File. 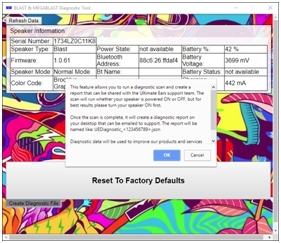 Open the BLAST MEGABLAST Diagnostic Tool. Connect your speaker to the computer using the USB cable that came with your speaker. Your speaker should automatically turn on after being connected to your computer. If it doesn’t, turn it on now. If the utility doesn’t recognize your speaker, click Refresh Data in the upper left corner of the tool. Under Reset To Factory Defaults, click Create Diagnostic File. Review the information and then click OK to continue. The diagnostic file will be created and automatically saved to your computer’s desktop. IMPORTANT: If the utility doesn’t recognize a Serial Number for your speaker, add something to the name of the diagnostic file to associate it to you, such as a case number if you have one, or your first and last name. 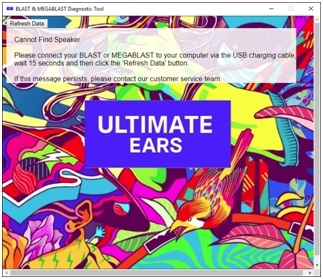 When you contact Ultimate Ears Support, let them know that you have run the BLAST MEGABLAST Diagnostic Tool and the agent will let you know where to email the file so it can be reviewed. Does Amazon listen to me or store any information when I’m not using Alexa? Press the Power button on top of the speaker (large hash button) to turn the speaker off, then back on again. Try a Factory Reset. See Perform a Factory Reset for more information. Does Ultimate Ears listen to me or store any information it hears from me? Make sure you speak clearly and try moving closer to the speaker. Try turning up the volume — Alexa might be responding but at low volume. Try turning down the volume — Alexa might be responding but at low volume. Try turning the speaker so the volume buttons face away from you — this places the listening microphone at a better position to hear you. If your speaker is upside-down or on its side, try placing it right-side up with the volume buttons facing away from you — this places the listening microphone at a better position to hear you. If your speaker is in the middle of a large or empty room, try placing the speaker closer to a wall — walls help redirect your voice towards the listening microphone. Can I use another cable and adapter for my POWER UP charging dock? Yes, you can, but we highly recommend using the cable and power adapter that came with your BLAST and MEGABLAST. You cannot use a micro USB cable and only connect to your computer for power. There is not enough power from your computer’s USB to power the dock (POWER UP). Can I connect my POWER UP charging dock to a computer or laptop to charge my speaker? We highly recommend using the power adapter that came with your BLAST and MEGABLAST. Charging from a computer or laptop will result in your speaker not charging at all. 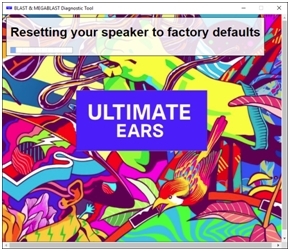 If you pair your speaker from your phone’s Bluetooth settings before setting up your speaker with the BLAST & MEGABLAST by Ultimate Ears app, you may not be able to complete the setup successfully. Try the steps below then try the setup again. Go to your phone’s Bluetooth settings and in the Paired Devices list, unpair the speaker. The steps for doing this may differ depending on your device. For example, Settings > Connections > Bluetooth > Tap the gear icon > tap Forget device. Turn Bluetooth on your phone OFF and then ON briefly. Delete the app and then download and reinstall a fresh version from the Play store. Turn the speaker back ON. DON’T pair to Bluetooth — instead, launch the app and go through the setup steps as instructed in the app. The app will prompt you to pair during the setup process. Make sure you have access to a Wi-Fi network so you can update the firmware on the speaker. Why won’t my app pair with my speaker? The most common reason for Bluetooth pairing failures between the app and your speaker is because the app on your phone or tablet isn’t the latest version. Check the app store for a newer version of the app. After you’ve updated the app, try pairing with your speaker again. In many cases, this will resolve the problem. If you are trying to set up WiFi on your speaker and receive a “Speaker Connection Lost” message, you may be running an old version of the app on your phone or tablet. Check the app store and update the app if there is a newer version available. After updating, try pairing your speaker again and set up WiFi. To set up your speaker, first download the Ultimate Ears app. This ensures that both your phone and speaker are ready to take full advantage of all the features your speaker comes with. Get the latest version of the Ultimate Ears App from either the Apple App Store or the Google Play Store. Make sure you have your wireless network information ready — during setup, you will need to connect to WiFi to update your speaker’s firmware and set up Alexa. Turn your speaker on before you begin the setup in the app — this ensures the app finds your speaker. If you have multiple speakers, you can add the additional speakers to the app once you’ve set up your first speaker. Follow the setup steps in the app — the app will walk you through connecting to WiFi and Bluetooth, updating the speaker’s firmware, as well as setting up Alexa. To get the app for your BLAST or MEGABLAST speakers, search for “Ultimate Ears” in the Google Play Store or Apple App Store. WARNING This procedure can permanently damage your speaker and should ONLY be used if the speaker won’t turn ON. Frequent use of the reset procedure is NOT recommended. 1. Briefly press the “-“ (volume down), “+” (volume up) and small action/Bluetooth buttons at the same time (See picture below). 2. Next, press the large power button on the speaker and it will turn back ON. Note: it may take a few moments for the speaker to reconnect to Alexa or repair to your mobile device. 3. After resetting the speaker, it’s highly RECOMMENDED that you use the Ultimate Ears app (available from the app stores for iOS and Android) to check for available firmware updates for your speaker. To do this, launch the app > tap on the settings icon > scroll to the bottom of the screen and press “Check for Updates.” (Depending on the version of the app you may need to disable Automatic Updates before you can manually check for updates. If prompted, follow the instructions to update your speaker’s firmware. Do I need an Amazon Prime account to use Alexa on the speaker? No, you don't need an account, but if you do have an Amazon Prime account, you’ll have access to Amazon Prime Music with more available content. Do I need to sign into Amazon? Your Amazon account is used to sign you into Alexa. It’s how Alexa distinguishes you from someone else and how your information is protected from others. Each time you make a request to Alexa, she’ll retrieve the most relevant information based on your Amazon account information. To connect your speaker to WiFi, you’ll need the Ultimate Ears app. The app will walk you through the initial setup of your speaker which includes connecting to WiFi. The app will also allow you to connect to a different WiFi network if you bring your speaker outside of your network. Make sure that your password and email address match — you can try logging in on www.amazon.com to test your login information. Why do I need to connect to Bluetooth after connecting using WiFi? The Bluetooth and WiFi connections of your Ultimate Ears speakers give you access to different features. 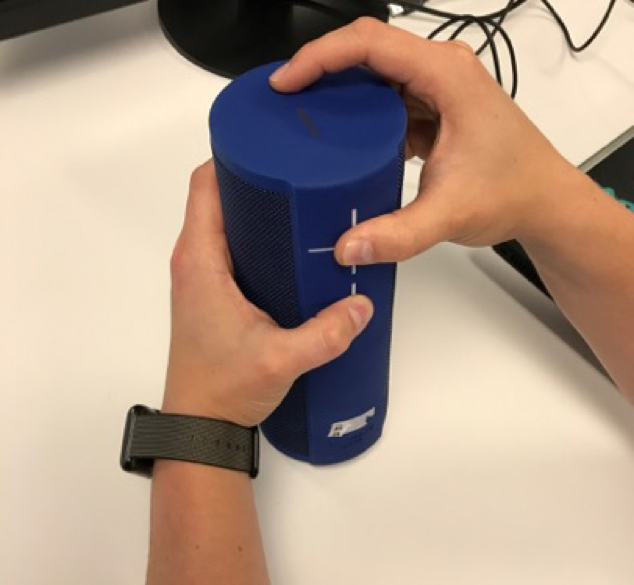 Press and hold the Bluetooth button on top of your speaker (next to the Power button) for five seconds or until you hear a tone indicating it is ready to pair. The Bluetooth LED indicator should blink white rapidly. In your device’s Bluetooth devices list, look for your speaker (BLAST or MEGABLAST) and tap it to connect. You will hear a tone indicating that the speaker is connected and the Bluetooth LED will be solid white. Make sure your speaker is turned on and is discoverable — press and hold the Bluetooth button down for five seconds or until you hear the tone confirming the speaker is in pairing mode. Move your speaker closer to your phone — it might be out of range. Move your speaker and your phone away from other wireless sources — you could be experiencing interference. Turn your speaker off, then back on again. Turn your phone’s Bluetooth off, then back on again. If you have multiple Ultimate Ears speakers, make sure you’re trying to pair to the correct one. If your mobile phone can’t find your speaker, try the following. It may take a minute or two for the speaker to restart and reconnect to the app. If the app displays that the speaker is still restarting, try turning the speaker off, then back on again. The app screen may take up to 30 seconds to update and reflect the speaker's connection status. Make sure you have the latest version of the app — check the Apple App Store or Google Play Store to make sure you have the latest version. Make sure your speaker is connected to WiFi — firmware updates come through WiFi and not over Bluetooth. If your speaker has less than a 20% charge, make sure you connect it to power before you start the update. If you experience issues during Bluetooth pairing or you see an error message, try the following. Go to your phone’s WiFi settings and remove any networks that are connected. Go to your phone’s mobile hotspot setting and turn it Off and then On at least once. Go back to the app and pull down on the WiFi scan screen to refresh the network list. Your mobile hotspot should appear in the network list. If it still doesn’t appear, try repeating steps 3 and 4. During the setup process, if you accidentally selected the wrong network, you can go back in the app and select a different network. Once you’re setup, if you decide to connect to a different network or change your network you can connect to the new network in the speaker Settings menu. Your speaker is ready to set up when the LED indicator on the Bluetooth button blinks rapidly. If the indicator isn’t blinking rapidly, press and hold down the Bluetooth button (next to the Power button) until you hear a tone or a voice confirmation that the speaker is in pairing mode. If you are connected to your speaker using Bluetooth, your music will come from either an app on your device or from local music files you have stored on your device. If your speaker is connected to WiFi, your music can be streamed from a cloud service via Alexa (ex. Amazon Prime Music, Spotify, iHeartRadio or TuneIn). Your phone is not connected to the speaker in this case. Important: Any Alexa request (except “Alexa… turn up the volume” or “Alexa … turn down the volume”) will drop your Bluetooth connection and switch to WiFi so Alexa can respond. If you’re listening to Bluetooth, and ask Alexa to do something, the action will occur using a WiFi connection. Music is streaming on Bluetooth and you ask Alexa to skip the track. Your Bluetooth connection will be disconnected and Alexa will skip the last track that was previously streaming over WiFi. Music is streaming on Bluetooth and you ask Alexa for the weather. Your Bluetooth connection will be disconnected and Alexa will give you the weather. Run your speaker under clean water. Use a minimal amount of mild soap to clean the speaker. Can I use NFC to connect my speaker? No, Blast and MEGABLAST do not have NFC compatibility. Does Apple Airplay work with my speaker? No, your speaker is not compatible with Apple Airplay. In the Bluetooth menu on your Android device, locate the speaker and tap Unpair. Hold down the Bluetooth button (next to the power button) until you hear a tone or a voice confirmation that the speaker is in pairing mode. NOTE: Note: The Bluetooth connection button will blink rapidly and you will hear a tone or a voice confirmation from the speaker indicating the speaker is ready for pairing. On your device, go to the Bluetooth menu to scan for devices. Tap your speaker to pair. In the Bluetooth menu on your iOS device, locate the speaker and tap the’‘i” icon next to it. NOTE: The Bluetooth connection button will blink rapidly and you will hear a tone or a voice confirmation from the speaker indicating the speaker is ready for pairing. Can I use my speaker with more than one source device at a time? No. BLAST and MEGABLAST do not support using multiple source devices at the same time. Can I revert my firmware to a previous version? No, you cannot revert firmware once you update. Rinse off with clean water and air dry. If your speaker isn’t playing music, check the following suggestions. Some music services can only play on Bluetooth or on WiFi — make sure your speaker is connected to the wireless preference of the music service you’re trying to playSee Play music on your speaker for more information. If your D-ring (standard or POWER UP) becomes defective and you’re in warranty, contact our support team and we’ll get you a replacement. If you need a replacement for something not covered under warranty or just want an extra D-ring, you can purchase one from the Ultimate Ears website. Click here to get to our spare parts store. Does my speaker come with a charging dock? Make sure you’ve replaced the standard D-ring with the D-ring that was included with your POWER UP. Connect POWER UP to the micro USB cable and power adapter that was included with your speaker. Center your speaker on POWER UP to start charging. The white LED on the front of POWER UP will pulse while your speaker is charging. Once fully charged, the LED will be solid white. If your cable stops working or becomes defective and you’re in warranty, contact our support team and we’ll get you a replacement. If you need a replacement for something not covered under warranty or just want an extra cable, you can purchase one from the Ultimate Ears website. Click here to get to our spare parts store. If your power adapter stops working or becomes defective and you’re in warranty, contact our support team and we’ll get you a replacement. If you need a replacement for something not covered under warranty or you just want an extra power adapter, you can purchase one from the Ultimate Ears website. Click here to get to our spare parts store. You can use your speaker when it’s cold, but we recommend keeping it out of extremely cold, subzero temperatures. The speaker is similar to your mobile phone. Extreme cold will affect the battery life and performance of your speaker. You can use your speaker when it’s hot, but we recommend keeping it out of direct sunlight on very hot days. The speaker is similar to your mobile phone. Extreme hot temperatures will affect battery life and performance of your speaker. Your speaker is rated IP67. This means it can survive immersion in 1 meter/3.3 feet for up to 30 minutes. Important: While we encourage you to take your speaker wherever the party goes, we also want it to look great and last as long as possible. We highly recommend that you thoroughly rinse your speaker with fresh water after using it in a swimming pool or the ocean. While the speaker is waterproof, the chemicals and salt in your pool or the ocean can damage the waterproof seals over time if not rinsed off after use. Your speaker is rated IP67. This means it can survive immersion in 1 meter/3.3 feet for up to 30 minutes. Yes. While we encourage you to take your speaker wherever the party goes, we also want it perform and look great as long as possible. Your speaker is IP67 certified, so it will survive submersion in water no more than one meter deep, for no more than 30 min. Important: If your speaker has been exposed to chlorine or salt water, rinse with fresh water and air dry completely before charging. USB port and USB cable connector must be completely clean and dry before charging. The USB charging cable is not waterproof. Low battery and charging but still critical. There are two ways to check the battery life of your BLAST or MEGABLAST Speaker. Inside the Ultimate Ears App, when your speaker is connected. Check the battery status right from the speaker without opening the app, press the “+/-” volume buttons on the speaker simultaneously. Can I connect my speaker using a 3.5mm jack? No. BLAST and MEGABLAST do not have a 3.5mm port. What music services work with my speaker? Does BLAST and MEGABLAST work with other Ultimate Ears speakers? No. BLAST and MEGABLAST will not work with any other speakers. It should take approximately three hours to fully charge both BLAST and MEGABLAST. Make sure you’ve replaced the standard D-ring (Black) with the D-ring (Silver) that was included with your POWER UP. 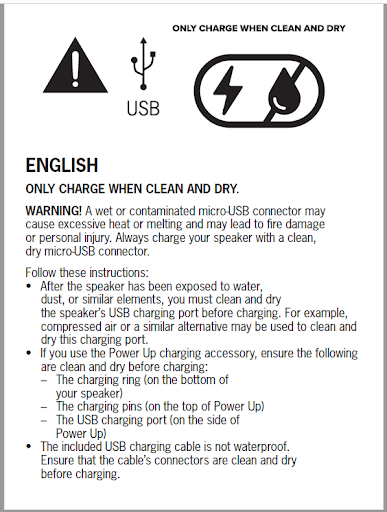 IMPORTANT: If your speaker has been exposed to chlorine or salt water, rinse with fresh water and air dry completely before charging. USB port and USB cable connector must be completely clean and dry before charging. The USB charging cable is not waterproof. Open the sealed weather door on the bottom of your speaker to locate the micro USB port — you do not need to remove the D-ring. NOTE: Designed to work with the power charger included with your speaker, not compatible with iPhone chargers. Plug the power adapter to the wall, connect the USB cable into the power adapter, then connect the micro USB connector to the speaker. On Android -- the volume control on your device and speaker are independent, so you adjust the volume on both speaker and device. On iOS -- the volume control on your device and speaker are synchronized, so adjusting the volume on either your device or speaker will be in sync. To turn on your speaker, press the power button (large hash button/LED on top of the speaker) and wait for the LED to appear indicating the speaker is on. To turn off, press the same button and wait for the LED to turn off. You will hear an audible deep drum sound when you turn the speaker on or off. To play content, you need to be connected to your speaker via Bluetooth. Local content is not supported over WiFi streaming. Make sure your device is connected to your speaker via Bluetooth. Open the your local content/music app and start playing content/music. Alexa and Spotify: Currently, Spotify is not supported by Alexa in MEGABLAST and BLAST. You can still stream Spotify thru a Bluetooth connection from your mobile device. Apple Music: You need to be connected to your speaker via Bluetooth. Apple Music is not supported over WiFi streaming. Open the Apple Music app and start playing music. Link your Pandora account in the Alexa app. Once you’ve associated your Pandora account, you can ask Alexa to play music from Pandora. Open the Pandora app and start playing music. Open the Spotify app and start playing music. There are two ways to play music on your speaker — Bluetooth and WiFi. Alexa Voice Control will only work on WiFi (dedicated network or Hotspot). The following music services can be played using WiFi and Alexa. How do I set up a group of speakers? Speakers can’t be controlled as a group, but multiple speakers can be added to the app and controlled individually. To select the speaker you want to control, tap the menu button on the top left (three horizontal lines) to go to the main menu. Your speakers will be listed — just tap the speaker you want to control. You can add multiple speakers to the app, but you can only control one speaker at a time. To select the speaker you want to control, tap the menu button on the top left (three horizontal lines) to go to the main menu. Your speakers will be listed — just tap the speaker you want to control. Does Alexa work on Bluetooth? Alexa will work on WiFi and mobile hotspot networks only. It will not work on a Bluetooth-only connection. Will Alexa work on WiFi-only? If I’m connected Wifi and bluetooth how is the music being streamed? What happens when I’m out of the range of my WiFi? Your speaker will lose its connection and the stream will stop. You will also hear a tone to indicate you’ve lost the connection. Your speaker will reconnect to the last WiFi network it connected to. Your speaker will remember up to four WiFi networks, and will only reconnect to the last one it connected to. Move your router and speaker away from other wireless signals (ex. Microwaves, cordless phones) — you could be experiencing interference. Make sure your router and speaker aren’t in an enclosed area, such as a cabinet — this may weaken wireless signal strength. Turn both your speaker and wireless router Off, then back on again. Advanced Troubleshooting Steps NOTE: For the following, you may need to access your router or network device’s setup pages. See your router’s documentation if you need help. Make sure you’re entering the correct network information (ex. SSID (wireless network name and encryption password) during setup. TIP: Some of these parameters may be long. For example, WEP128 has 26 characters. Enter this password carefully, or opt for a security type with a shorter password (ex. WPA has only an 8-character minimum). If your SSID (wireless network name) is hidden, take care when entering this during setup. SSIDs are generally case sensitive and they recognize spaces in the text string. Make sure your router and other network appliances have the latest firmware updates. Try changing wireless channels. An area with heavy network saturation can cause problems with networks on the same channel. If your network includes repeaters, range extenders and access points, try disabling these temporarily to ensure that your speaker is connecting properly to your main router. If you have a dual-band router, make sure your 2.4ghz SSID and 5ghz SSID are different to prevent confusion between the devices while connecting. If you have additional security settings on your router, try temporarily disabling them or configuring them accordingly. Example: Some routers let you regulate connected devices using a unique device ID called a MAC address. IF only specified MAC Addresses are allowed to connect, your speaker may not connect properly. Because most enterprise WiFi networks require additional credentials or have extra security measures in place, we do not recommend setting your speaker up to connect to enterprise networks. Do I need the Ultimate Ears app? The app is required to set up your speaker, to update your speaker with necessary updates, to connect to a WiFi network, and to set up and use Amazon Alexa. If you don’t plan on using Amazon Alexa, you’ll only need the app for the initial setup, download the required software, and to perform periodic updates. Go to Speaker Settings (tap the gear icon on the top right of the app Home screen). Tap Speaker Name and change the name of your speaker. This will modify the name of your speaker in both Bluetooth settings and on the home screen of the app. This change will not be reflected in the Alexa app. Go to the Settings section of the Amazon Alexa app. This will not modify the name of your speaker in both Bluetooth settings and on the home screen of the Ultimate Ears app. This change will only be reflected in the Alexa app. Does my speaker have an alarm feature? Yes, through Alexa. When you are signed into Alexa, you can ask her to set an alarm, set a reminder, or a timer, and the speaker will wake and play the alarm or timer at the requested time. Only the main account holder on an Amazon Prime Household account can stream Prime music. Streaming to additional devices for linked accounts requires Amazon Music Unlimited Family Plan. To learn more, click here. You can add speakers by going to the main menu of the app (the three horizontal lines on the top left of the app home screen) and tapping the Add a speaker button. Can I change the equalizer on my speaker? The Equalizer can be accessed from the home screen of the Ultimate Ears app (the speaker must be connected). Just tap the Equalizer icon. Once you're in the Equalizer settings, tap the left and right arrows to scroll through the different presets. You can also select Custom to manually adjust the settings. To get the app, just search for Ultimate Ears app in the Apple App store. You can get the app for Android in the Google Play Store. Search for Ultimate Ears app. After the initial update, your speaker will automatically download new software with important bug fixes and new functionality as the it becomes available. The auto-update feature happens periodically in the background — there’s nothing you need to do. You may notice the lights glowing on top of the speaker or it making the power-on sounds after a new update has been installed. We recommend keeping the auto-update settings enabled, but it can be disabled at any time from Speaker Settings (the gear icon on the top right of the app). Go to the Speaker Settings section of the Ultimate Ears app (the gear icon on the top right of the app Home screen). Scroll down to the bottom of the page. The app will display the current firmware version and will automatically check if there is newer firmware available. If the auto-update setting has been disabled or if you’re just curious, you can always tap Check for Updates to manually check for software updates. Do I need the app to update my speaker? The first time you set up your speaker, you'll need the app to download the necessary software. After the first update, the speaker will automatically download new software with important bug fixes and new functionality as it becomes available. The auto-update feature happens periodically in the background — there’s nothing you need to do. You may notice the lights glowing on top of the speaker or it making the power-on sounds after a new update has been installed. We recommend keeping the auto-update settings enabled, but you can disable it at any time from Speaker Settings (the gear icon on the top right of the app). Do I need the app to connect the speaker to a mobile device over Bluetooth? You do not need the app to connect your speaker and your mobile device over Bluetooth. See Connect your speaker directly through Bluetooth for more information. Do I need the app to connect to WiFi? Yes, but only when you initially set up your speaker. The app is needed to connect and configure WiFi on your speaker. After the initial setup, you’ll only need to use the app if your WiFi network settings change or if you want to set up your speaker on another WiFi network. Do I need the app to set up my speaker? Yes, the Ultimate Ears app is required when you set up your speaker, connect the speaker to WiFi, and to update your speaker’s firmware. You’ll also need the app to authorize your device with your Amazon account for Alexa. Can I listen to Bluetooth and also have the Alexa microphone muted? Open the Ultimate Ears app. On the homepage, Tap the microphone icon. Tap “OFF” to disable the microphones. You will hear a tone indicating the microphones have been muted and a small red light will appear on the top of the speaker. Tap “ON” to re-enable the microphones.